Pieter Janz. Saenredam (1597-1665) is admired for the breathtaking (and improbable) light in his wonderful interiors. In St. Anne, below, the image is largely held in light middle tones so that the dark, sprightly figures along the bottom command the space. That is masterful; but then he tied himself to a mechanical one-point perspective where all the receding lines converge on point: the head of the lady with the dark-clad gent and child. 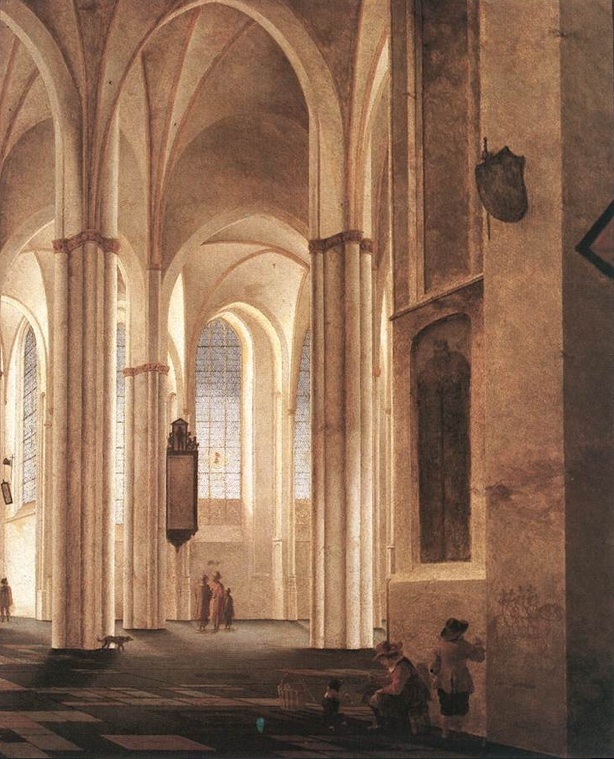 Meanwhile, all the lines across–the back wall, the column bases, the roof above the pulpit–are drawn straight across the picture plane, parallel to the bottom of the canvas. The result is that the farther rectangular shapes are from center of the composition, the odder and less rectangular they become. Similarly, all verticals are drawn as vertical rather than converging as they rise, so that as the eye follows walls and columns up the walls seem about to collapse outward. 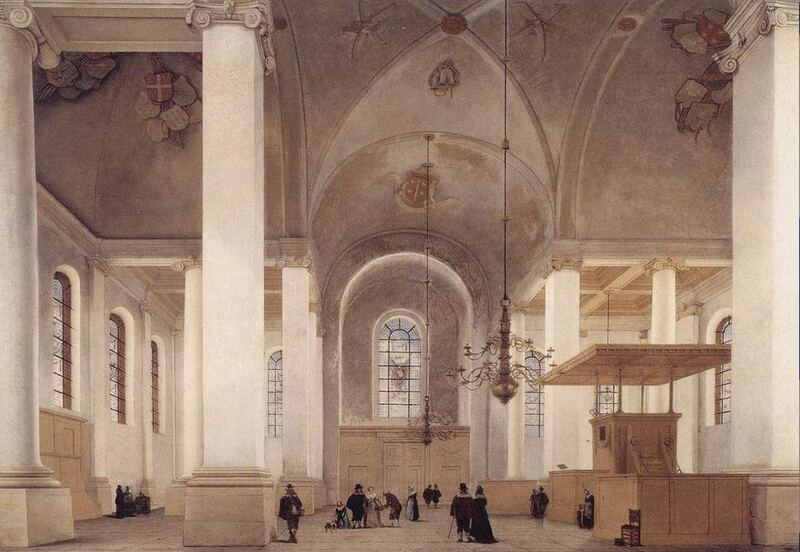 One-point perspective works for him, more or less, in a narrow view such as the Buurerkerk, left, because the eye scans it in one view. But in a wide space like St. Anne the eye shifts several times as it moves from the center to the sides. The pulpit would be seen straight on, and not, as here, out of the corner of the eye. The essential note here is that things converge as they get farther away. So the pulpit’s nearest wall, being below eye level, would get smaller–that is, rise slightly to the right. The pulpit itself, being above, would slope downward, and the ceiling, together with the far wall, being higher still, would slope more sharply. Our sense of space is disoriented when they don’t. Single-point perspective wasn’t Saenredam’s folly alone. 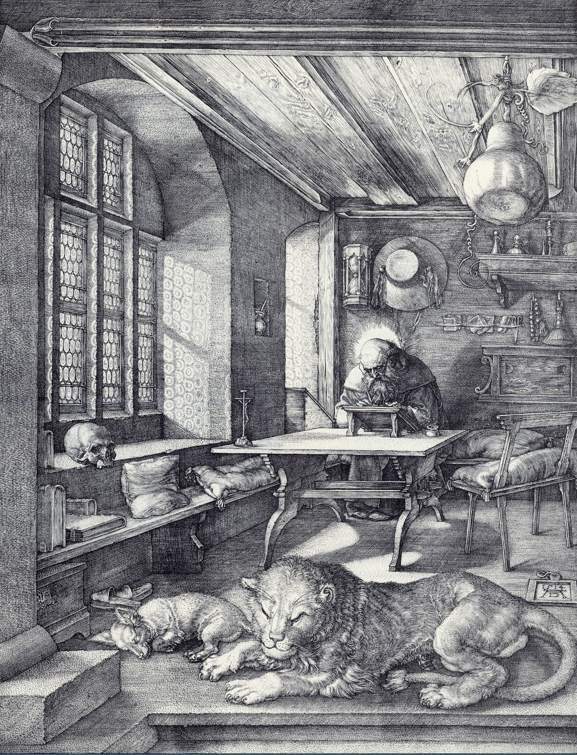 It was taught in an influential book by Jan Vredeman de Vries (1527-1604), and a hundred years before that was employed by no less a hero than Albrecht Durer in his otherwise breathtaking St. Jerome, below. Here we have an oblique view into the room, but the back wall is seen square-on. This makes Jerome’s desk much wider on the left side than the right, while the left legs practically do splits.